It is impossible to tell the story of tenants in Chicago without telling the story of the Chicago Residential Landlord Tenant Ordinance (RLTO). The RLTO is now 30 years old and counting: it was enacted by the Chicago City Council on September 8, 1986. The story of the Ordinance reveals the power of community organizing and a moment in the city’s political life when the rights of tenants were championed by Mayor Harold Washington. The Ordinance became law in a city often regarded as a haven for the real estate industry. One key element of the history behind the Ordinance is the impact of organizing in the Rogers Park community on Chicago’s north side. In that community, with its heavy concentration of rental properties, tenant issues were prominent in the 1970s. In 1979, they elected David Orr as Alderman of the 49th Ward. In the ensuing years, the Rogers Park Tenants Committee (and other smaller groups in Rogers Park) grew and organized on key tenant issues, including escalating rents, repairs and lead abatement. During this period, groups in many communities around the city – some funded by local foundations – also worked on tenant issues, including Austin, Englewood, Logan Square, South Shore and Uptown. While community groups targeted aldermen to support the Ordinance, they also put considerable pressure on the city’s Housing Court, an institution that was characterized by years of mismanagement. A new organization, the Lawyers’ Committee for Better Housing, emerged to help fight the battle in Housing Court. 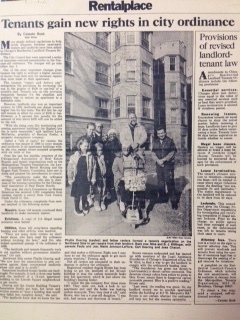 Meanwhile, in 1981, an activist group called the Housing Agenda addressed tenant issues through a committee. That committee spun off and became the Metropolitan Tenants Organization (MTO) in 1985. Early on, supporters of tenant rights also proposed a Fair Rent Commission, which would create a place to appeal unfair rent increases. While important, this issue did not gain sufficient support at the time, though it remains a concern among many activists and tenants today. 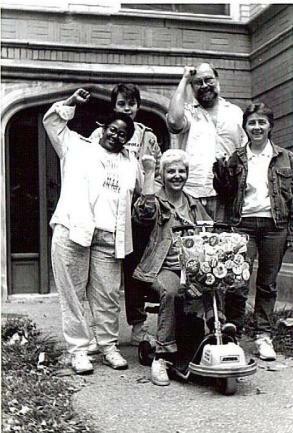 In the early 1980s – the time of “Council Wars” in Chicago’s City Hall – efforts to address tenant rights in the City Council languished. Work continued however, an ordinance was drafted using one that had passed in Evanston as a model, activists targeted aldermen whose support could make a difference, and nonprofit developers were also using various tools, including the city’s Tax Reactivation Program, to further the cause of affordable housing. And significantly, Harold Washington, an ally and advocate, was elected Mayor – he did not though have control of the city council. That changed in early in 1986 when special aldermanic elections were held in accordance with a new ward map. In those elections, Luis Gutierrez (now a U.S. Representative) was elected as an alderman, giving the mayor’s allies a council majority. By May, Washington and his allies had control of the Council. He identified the tenant bill of rights – which became the Ordinance – as a priority. By September of 1986, it became apparent that the Ordinance was about to pass – in a big way. It wasn’t comprehensive (the Ordinance exempted owners in owner-occupied buildings, for example) but it went much further than any measure had before. As it become clear that there were enough votes for the Ordinance, numerous aldermen who had originally opposed the measure decided to support it. The Ordinance passed 43 to 7. With the Ordinance, tenants finally had legal backing to support their issues. In the months that followed, there were a couple of challenges to the Ordinance. First, real estate interests tried to challenge its lawfulness in federal district court – but lost. Later, there was another effort to turn things around in Springfield. That failed as well. Over the years, sustained opposition to the Ordinance has never materialized – nor has it completely gone away. In the current council, efforts are being made in the Housing Committee to weaken the measure’s enforcement mechanism. That Housing Committee is now headed by Alderman Joe Moore, Orr’s successor in the 49th Ward. Currently, the only way to effectively enforce the RLTO is to take the landlord to court. This requires an attorney. If landlords violate the law and lose in court, the landlord must pay for the renter’s attorney fees. Attorneys are willing to represent renters because they know if they win, the landlord has to pay. The Realtors are proposing a change to the law so that even if they lose they may not have to pay attorney fees. This will make it impossible for low and moderate income tenants to afford attorneys and will only lead to more evictions and displacement. This is just one of the many reasons tenants will take to the streets and flex their renter power on September 22nd. Monied interests should not control who has the ability to live in a safe, healthy home. Every Chicagoan deserves a roof over their head. AND, where has MTO been all this time? Where are the other not for profit corporations in Chicago been? This problem with the major realtors have been going on for decades. I have participated in three efforts to come to agreements with the landlords on what reasonable changes they want to the RLTO, and the tenants organizations involved (and if I recall correctly when I was on the board of MTO I was there on behalf of MTO) and each time the landlords alleged representatives in effect, told us to go you-know-where, and they wanted what they wanted and that is all there is to that! To many landlord, tenants are not people! And their, tenants’ counsel are also, “not people”. The RLTO was an outgrowth of the civil rights movement and unless you were an adult or close to it, you do not recall what was going on in Chicago and in the United States when Dr. King was shot and killed. The country was on fire and violence even took place in downtown Chicago. When the first news on WGN-TV came out about this not too many days ago, I sent email to some powerful folks about the need to get into the fray here and work together to try to engage in meaningful discussion with the landlords and big management company groups, and guess how many responses I got from what was, I believe, the first “heads-up” on this? Can you guess? The answer is NONE! And so, when the funds run out for the Not-For-Profits or grants are not really related to overall tenants’ rights and when lawyers can no longer afford to help tenants find justice, where will the tenants be? And, you all know where….. in the street and add all this to come and you know what? More crime! More shootings! MORE DEATHS. The bad landlords and managers who do not educate their clients are making things worse. So, what is to be done? Lawyers like myself can provide the ideas, concepts and leadership that is needed, but most of us are, although good lawyers who fight for our needy tenants, are NOT politically adroit or connected. And I have seen what comes next: Tenants get evicted because they demanded repairs or did not get repairs done by the landlord and look around the courtrooms that handle evictions in Chicago and you will seldom see anything but African Americans, Latinos and other minorities making up 90% or more of the tenants and over 90% of whom can not find lawyers to vigorously represent them! And when the Sheriff puts them on the street and mothers don’t have money for food let alone rent, and fathers are not there or to be seen and if you read our two fine newspapers who tell it like it is and we are now setting records for shootings and deaths!!!!!! I have been a vigorous tenants’ advocate for a very long time and this is the worst I have ever seen and if you let the landlords and management companies get their way, you can pretty well predict what will happen next. AND, I dare those in leadership and in the City counsel, I DARE THEM to step into a debate to tell us WHY what they demand is what they want and why. I DARE THEM! AND, who among the NFPs will step forward and tinker with their careers in fighting the top 1% of our fine American Society. Looking for volunteers and I will be very happy to put in my two cents at the first meeting, but if even this becomes a “beauty contest” to see just who is the allegedly best persons to represent the tenants, then even a call to action will be counter productive.